The Institute for Veterans and Military Families at Syracuse University (IVMF) and local veteran-owned business Iron Art are teaming up for the second time to make a difference in the lives of veterans and military families making the transition to post-service life. The local graphic design and marketing company has created a “Military Otto” SU basketball T-shirt, the proceeds of which benefit the work of the IVMF in supporting veterans and military families post-service, including its portfolio of entrepreneurship training programs. The short is available for $20 at the SU Bookstore in the Hildegarde and J. Myer Schine Student Center, Carrier Dome Orange Shoppe (Aisle 109 and Aisle 122) and online at bookstore.syr.edu. 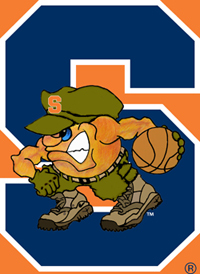 The “Military Otto” shirt makes its official debut at the SU Men’s Basketball game against Big East team Providence this Wednesday, Feb. 20, at the Dome. IVMF, Iron Art and SU Athletics Marketing staff will wear the shirts at the game to help spread public awareness of the benefit project. A special 20-second promotional spot will air on Dome video boards during the game. In addition, Iron Art is holding a contest in which contestants can win one of four special prizes by submitting a picture of them wearing the T-shirt to the Iron Art Facebook page. The IVMF and Iron Art first teamed up in November 2012 for a benefit at Syracuse’s Dinosaur Bar-B-Que, to launch the sale of an Iron Art-designed “Combat-Dino” T-shirt featuring the iconic dinosaur sporting military apparel. Proceeds from T-shirt sales benefited the IVMF and the Warrior Salute program of Rochester-based CDS Monarch. The fundraiser brought in close to $2,500 in support of the IVMF. Iron Art was founded by U.S. Army National Guardsmen Specialist Brian Kennedy and First Lieutenant Jason Uhlig, veterans of Operation Enduring Freedom most recently deployed to Afghanistan with the Syracuse-based 2nd Battalion 108th Infantry Regiment, 27th Brigade. According to Kennedy and Uhlig, the mission of Iron Art is to make a positive change in the world through art and design. For more information, contact Uhlig at 315-263-6918 or ironart315@gmail.com.